Mark Anscombe calls on fringe players for Sunday’s Pro12 clash with Zebre in Italy. Jared Payne, one of the more familiar faces in Anscombe's squad. INTERNATIONAL OBLIGATIONS HAVE forced Mark Anscombe’s hand for Ulster’s RaboDirect Pro12 trip to Zebre. With the bulk of his regular starters involved in November internationals, Anscombe has taken the opportunity to blood some new faces for Sunday’s rescheduled game at the Stadio XXV Aprile. Three of the province’s stars — centre Luke Marshall, winger Craig Gilroy and out-half Paddy Jackson — will make their first Ireland starts in Saturday’s non-cap test against Fiji in Thomond Park. Scrumhalf Blane McIlroy has been added to the provisional squad as cover for Ruan Pienaar, who is away with the Springboks, and Paul Marshall, who was named today on the Ireland bench. Four of Anscombe’s contracted second rows are unavailable and so back-row Robbie Diack could be asked to cover at lock, while Academy player James Simpson and full-back Ricky Andrew could win their second caps. Ulster currently top the Pro12 standings by two points from the Scarlets. The trip to Zebre was postponed following the tragic death of Nevin Spence in September and with no other teams in action this weekend, a win would see them stretch their lead and extend their 100% start to the season to eight wins from eight. Forwards: Rob Herring, Niall Annett, Nigel Brady, Callum Black, Ricky Lutton, Adam Macklin, John Afoa, Neil McComb, James Simpson, Robbie Diack, Mike McComish, Ali Birch, Roger Wilson, Nick Williams. Backs: Michael Heaney, Blane McIlroy, Niall O’Connor, Stuart Olding, Paddy Wallace, Jared Payne, Michael Allen, Chris Cochrane, Ricky Andrew, Peter Nelson, Adam D’Arcy. 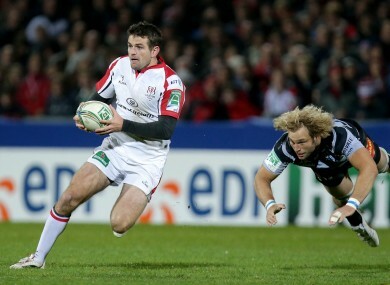 Email “Ulster look to fresh faces for Italian job”. Feedback on “Ulster look to fresh faces for Italian job”.